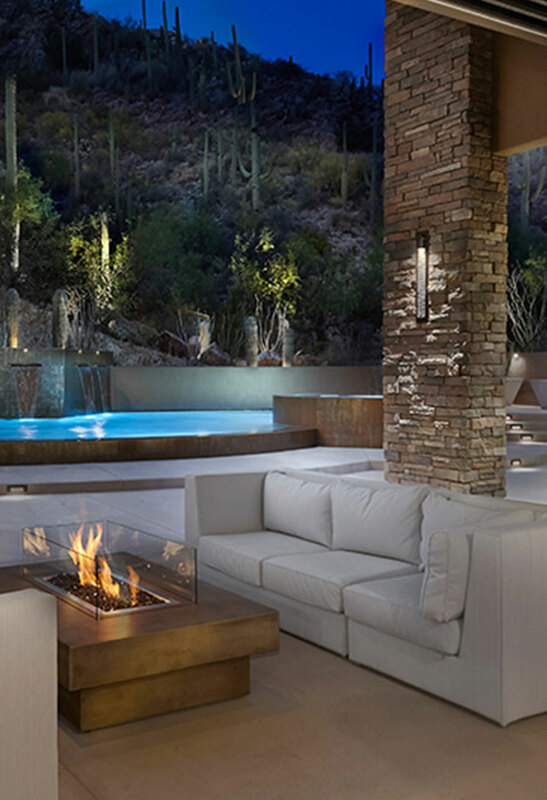 Pepper Viner has built custom homes for many satisfied customers in Tucson, Arizona. With a choice of house plans and hundreds of custom options, Pepper Viner will build the home you have been dreaming of! More Choice. More Quality. More Home. Initial meeting: Meet with the Director of the Custom Home Division at Pepper Viner to discuss what you are looking for in a house plan. Home site: We can find the perfect location for you, or we can build on your home site. Walking your building site: Orient the house for the best views and to find the correct solar orientation to increase energy efficiency. During the site visit, we will take the topography of the site into consideration and even mark the vegetation you’d like to have preserved. Taking care of details: Pepper Viner Homes is great with the small stuff. We make sure that your new home meets the CC&R requirements and design guidelines for your community. You don’t have to worry – this is something we do every day. Building your home: Once we get started, we make sure you’re in the loop through every stage of construction. • Visit the job site whenever you like. • Get a complete schedule of construction checkpoints and walk-throughs. Save money by selecting one of our designs. Pepper Viner has a choice of house plans that are engineered, approved and ready for you to customize! Don’t pay for these expensive professional services. Save thousands before construction begins with one of our designs. Pay lower prices with suppliers and trades based on Pepper Viner’s’ volume of business. Secure Financing, site preparation, plan approval, utility requirements, code compliance and more – all through one place at one price. How does the Pepper Viner Customized Home Program work? It’s simple. You tell us what size home you want, the number of bedrooms and baths you need, whether you want a family room or a great room and all the other features that are important to you. Choose a 2 or 3 car garage, an entry courtyard – all the things that will make this your dream home. We will provide you with a choice of house plans to get the process started. Then, we will work with you to customize your home to your exact needs. We’ll provide you with an estimate of the cost of your new home and we’re ready to build it on your homesite! Pepper Viner will give you everything you want – a new home that’s exactly right for you and a lower cost all at your perfect location. How do I save money by using Pepper Viner to build my home? You’ll save money every step of the way. Start with the house plans – we have them. You won’t have to pay to have them drawn up so you save thousands from the very beginning. You get the advantage of the lower prices we’ve negotiated as a community builder with our various trade partners. Finally, Pepper Viner has worked with many municipalities in the Tucson area so you’ll save time on permits and approval. Simply, you get more home for less money – a lot less and save time in the process! Will I be able to make changes? Of course! And, again we can save you money. Pepper Viner offers Designflex – the opportunity to make changes to the interior space of your home. We have compiled literally hundreds of Designflex options – the custom house plans are already drawn and approved. You just tell us which ones you want. Plus, you’ll have the freedom to choose all the details for your new home. Lighting, countertops, flooring and more – the choices are all yours! We want to build! Can Pepper Viner help us find a homesite? Yes! First ask yourself if you are more comfortable living in town or on the outskirts. Don’t forget to consider your commute to and from work and your needs for shopping, schools and services. When you tell us where you want to live, we’ll use all our real estate connections to find you a wonderful homesite. Who takes care of getting ready to build? Pepper Viner is your complete home builder. We will do a cost evaluation for developing your site, and help you situate your home in the right position to maximize views, solar orientation and energy savings. We understand all zoning, sewer/septic, testing and utility requirements. We’ll break them down for you and make sure that each is evalutated properly. From the day we walk on your homesite for the first time until the day we hand you the keys to your beautiful new home, we’re your partner! Can you help with financing? Again, you take advantage of the business relationships Pepper Viner has established over the past 25 years. Our lending partners offer many options that they will tailor to your needs. Construction loans, construction to permanent loans that offer a one-time close or conventional home financing are all available. Can I see my home before it’s built? That’s one of the biggest advantages Pepper Viner Homes offers you! We have constructed these homes and know that the house plans work. We may even be able to arrange for you to tour the completed home that interests you so you can be absolutely certain it’s the home you’ve always dreamed of owning. You can also take a virtual tour on our website. How long will it take to construct my new Pepper Viner home on my homesite? Typically, the actual build time for a new home is from 5 to 8 months. The overall process will be a bit longer as we take care of finalizing your house plans, Designflex selections, obtaining approvals from the municipality and completing the pre-construction meetings. Pepper Viner is committed to giving you outstanding value and we will work with you to make sure your home is constructed within your budget. When we know all the details of your new home, we will be able to provide a final price. How often can I visit my home while under construction? We understand the desire and need to visit your new home while it’s under construction. We encourage planned visits to the site. Due to potential construction hazards, we typically try to set site visits after trade partner working hours. Generally, mid to late afternoons are best because most trade partners have completed their work for the day. We are governed by OSHA requirements so planning a visit ahead allows Pepper Viner personnel an opportunity to ensure that proper safety practices are being followed. Is my home covered by a warranty? We are pleased to provide a Home Buyers Warranty for up to 10 years on the foundation and structure of your home. We have a full 1 year service warranty on the entire home and up to 2 years for selected items. With Pepper Viner Homes, you buy with confidence!